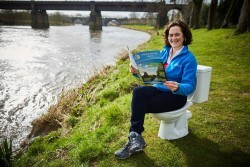 Check your septic tank for World Rivers Day! Is your house one of the 60,000 properties in the North West with a private sewage treatment system or septic tank? There are lots of (simple) ways you can help protect our rivers and seas in the spirit of Word Rivers Day! Water samples taken by the Environment Agency and the Rivers Trust highlight that certain waterways are failing the safe limits for faecal bacteria found in the water, sometimes by as much as 10 times over the limit, due to poorly maintained septic tanks. Call of Nature is a region-wide campaign raising awareness of the pollution risks that badly maintained septic tanks, cesspits and package sewage treatment plants can cause to the North West’s rivers and waterways. The campaign advises how everyone can take action to ensure private systems are well maintained in order to protect their local environment. The North West region has the highest number of private sewerage systems in the UK; with 60,000 properties not connected to the public sewer network. Considering the average septic tank for a household of four holds 2720 litres of wastewater, the combined volume of wastewater in the regions septic tanks would fill the equivalent of 65 Olympic size swimming pools! A well maintained septic tank does not cause any problems; they work like miniature sewage treatment systems, which store and treat wastewater from households. However, when they are not serviced properly, there can be a number of negative consequences for rivers, seas and wildlife. Household wastewater is teeming with bacteria, viruses and chemicals that can pass into and contaminate rivers, streams and seas if the system is faulty. Pollutants like these can harm wildlife; killing native plants, fish and shellfish. The pollutants also increase the chance of illnesses such as eye and ear infections for people using the water, from paddlers to water sports users. Private sewage treatment systems need to be repaired or replaced if they are not in good working order by an accredited service engineer. Signs that it needs repairing or replacing will include; leaks, cracks in tank walls or pipes, blocked pipes, pools of water around the drainage point, sewage smells, a failed motor, a failed pump or a failed electrical supply. 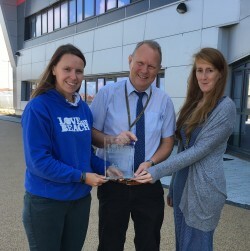 This week, LOVEmyBEACH Campaign Manager, Stephanie Wyatt awarded Blackpool & Fylde College a ‘LOVEmyBEACH Hero’ award to recognise the work carried out by its Marine Biology students to improve bathing water quality in the area. Many of these initial research projects have led to further investigatory works by the Environment Agency and other partners; helping to protect bathing water quality across the Fylde coast. Simon Bennett, Catchment Co-ordinator at the Environment Agency has been working with the college for several years on the projects and added: “Blackpool and The Fylde College is a great partner to work with; the students show impressive enthusiasm year after year and are a pleasure to work with. B&FC science lecturer Trevor Lund said: “Real life projects are so important for our students and give them valuable industry experience as part of their study programme. “Working with the Environment Agency and the LOVEmyBEACH campaign highlights the importance of multi-agency working when tackling huge issues such as marine pollution. “It is very much a ‘win-win’ situation for us. Our students get the experience of working alongside industry professionals on projects which have a big public impact and give enormous job satisfaction. Anyone wishing to study a degree in Marine Biology at B&FC can enrol from Tuesday 28 August 2018 to start their course in September. The course can be studied as a foundation degree or as a full BSc. Visit www.blackpool.ac.uk for more information. 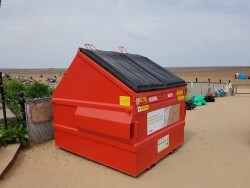 Two huge red bulk waste bins are in place in West Kirby and New Brighton this Bank Holiday weekend and everyday throughout the summer at New Brighton – as part of Wirral council’s response to keep the beaches and seas clean, enabling visitors to #binit4beaches. The bins – one in West Kirby and one in New Brighton – will be placed close to the beach and promenade and will be taken away to be emptied on Monday mornings. Combined with the skips and public litter bins already in place around each resort, the massive capacity of the new bins should mean there can be no excuse for weekend visitors to leave their litter behind or next to an already-full bin. Cllr Matthew Patrick, the new Wirral Council Cabinet member for Environment, said: “I was horrified by the complaints and photographs we received during the early May bank holiday – rubbish piled up alongside overflowing litter bins and other litter left behind on the beach or pavement. “Though there were crews from our waste partner, Biffa, on duty all weekend emptying litter bins and carrying out street cleansing, it was clear that the sheer volume of waste generated by the large number of visitors attracted to our beautiful coastline by the fine weather had proved overwhelming. For more tips on how you can help keep the beach clean during your visit please see out top 3 tips here. Our beaches are important and the more people helping us keep them that way, the better! Get involved with LOVEmyBEACH….